Our Environmentally Friendly Path and Patio Cleaner kills green growth without the need for washing off, scrubbing or pressure washing. Plus no plastic waste and minimum and recyclable packaging. Simply drop the sachet into a watering can or sprayer add 5 litres of water, wait 2-3 mins, mix briefly, apply using a fine rose fitted to a watering can or use a pump action garden spray. Improved results are achieved by using a fine or ‘mist’ spray, saturate the area to be treated with the product, for difficult to treat areas apply two lighter coats one day apart, very difficult areas may benefit from the product being finished by working in with a brush. 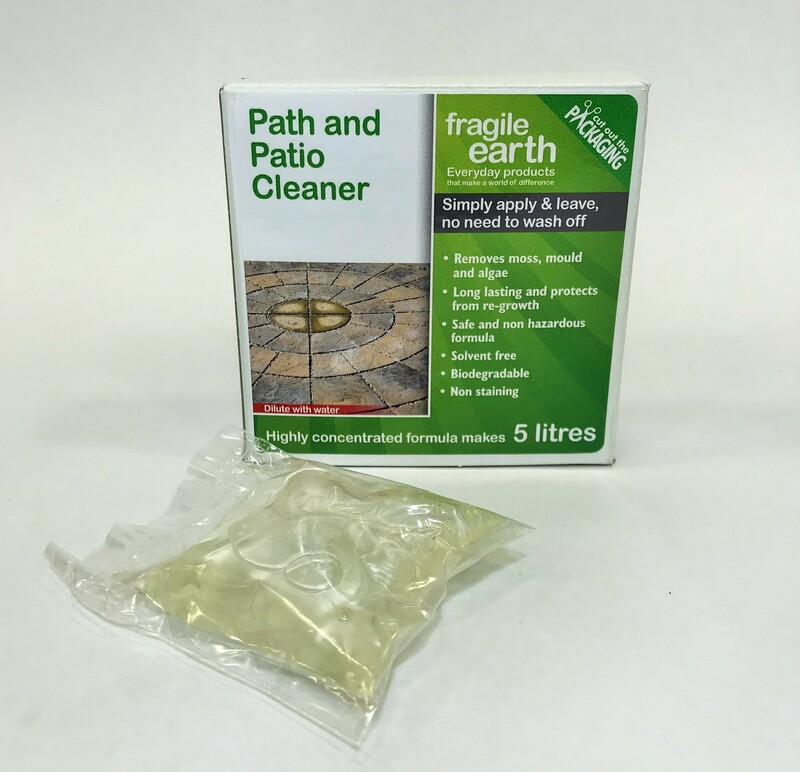 5 Litres of Path and patio cleaner will cover up to 30m2 depending on soiling and porosity. Avoid using if rain is imminent or expected within 6 hours. Ensure debris is removed before treatment. On heavily soiled areas, a second treatment may be required. Totally safe and non-hazardous to children and pets once dry. Does not contain bleach or acids and is made from biodegradable ingredients. Ideal for use on paths and patios that have been exposed to the weather all year round which can become very dirty and attract moss, algae and mould that can make these surfaces very slippery. 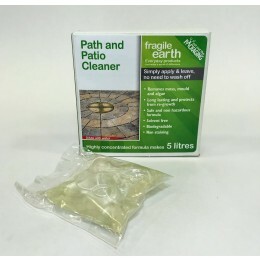 Each 50ml sachet makes 5litres; dilution up to 10 litres can be used for spray applications because Fragile Earth's No Scrub Path and Patio Cleaner comes in a sachet, there is no bulky container to dispose of. Our Environmentally Friendly Path and Patio Cleaner kills green growth without the need for washing off, scrubbing or pressure washing. Simply drop the sachet into bucket or watering can, add 5 litres of water, wait 2-3 mins, mix briefly and apply by brush or watering can with rose fitted. Path and patio cleaner will cover up to 30m2 depending on soiling and porosity. A Soluble Sachet Algicide, delivered CARRIAGE PAID.